The English flag has its origins in the twelfth century. St. George is then known for legends relating his exploits, especially when he grounded a dragon in Libya, that was terrorizing the people of Silenus. This required that two people had to be drawn and given for his meal every day. St. Georges was near the day the King's daughter was designated. He beat the dragon and became a hero for the people. Before the battle, he signed himself of the cross, which will then be taken to symbolize him through Saint George�s cross. This flag is used for the first time during the Crusades of the Middle Ages. At the beginning, French wearied the red cross on white background, while English banner consisted of a white cross on a red background. Henry II, king of England, asked the French king Philip II to exchange their flags, because English were still very attached to the symbol of St. George. Philip agrees and gives the flag to England. An alternative, but less credible explanation, is that this flag would be the city of Genoa�s one, that brought its protection over a large part of Mediterranean sea, including the English commercial vessels, which adopted its flag in return. You can download it in different sizes, in a decidedly modern design for your personal use, or for wider use. England's flag is available in 4 different sizes. Resolution: Icon Size: 200 x 120 px - Blog Size: 500 x 300 px - Website Size: 800 x 480 px - Wallpaper Size: 1500 x 900 px. 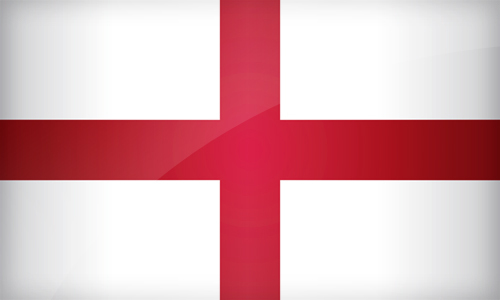 Keywords: Flag england wallpaper, English, Commonwealth of Australia, National english flag, banner, pictogram, country, icon, England icon, international, London, London, Birmingham, Manchester, Leeds, Europe. This page has been viewed 8120 times.